Located next to a beach on the unspoiled southern part of Rhodes island, Rodos Princess Beach Hotel is a modern four-star hotel, ideal for couples and families seeking a friendly atmosphere and a relaxing holiday. The town of Lindos with its famous Acropolis is located at 15 km, the traditional village of Asklipion at 5 km and Rhodes town at 54 km. 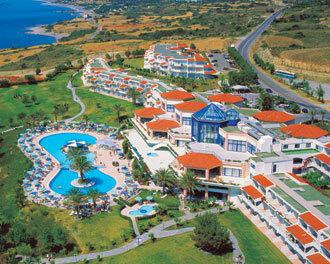 The Rodos Princess Beach Hotel has a total of 356 spacious guestrooms, the majority with sea view. All guestrooms are appointed with modern amenities for maximum comfort, including full air conditioning, heating, balcony or terrace, hair dryer, full bath, direct-dial phone, mini bar and Satellite TV with international channels and in-house music channels. The main restaurant, which sports a spacious terrace with magnificent sea views, serves a rich buffet offering guests the opportunity to taste a variety of delicacies from the international and local cuisine. A separate restaurant serves a variety of meals for children supervised by a team of professionals trained in child care. Lunch and dinner are served at the pool tavern “VENUS”, while light snacks can be enjoyed at the beach snack restaurant “DIOGENIS”. Other facilities include a large exotic swimming pool, children’s pool, indoor heated pool, shopping gallery, beauty shop, baby sitting, billiard room, guest parking, table tennis, mini soccer, mini golf, mail service, concierge, TV room, sauna/massage, game room, fitness center, laundry/dry cleaning, kinder garden, 24-hour doctor, car and motorbike rentals. Guests have the opportunity to enjoy a great variety of sports including bicycling, jet ski, cycling, paragliding, scuba diving, row boat, wind surfing, banana boat, mini golf, water skiing, water polo, canoe, windsurfing, basketball, tennis, beach volley and beach football. An animation team is available day and night, organizing a variety of games, musicals, competitions, sketches, demonstrations, cabarets and more at the hotel’s own amphitheatre. Once a week there is a Greek show with live band and dancers, as well as an Oriental show. The hotel has a meeting room with 150 pax capacity, equipped with telephone services, presentation equipment, fax services, photocopy and Internet services.